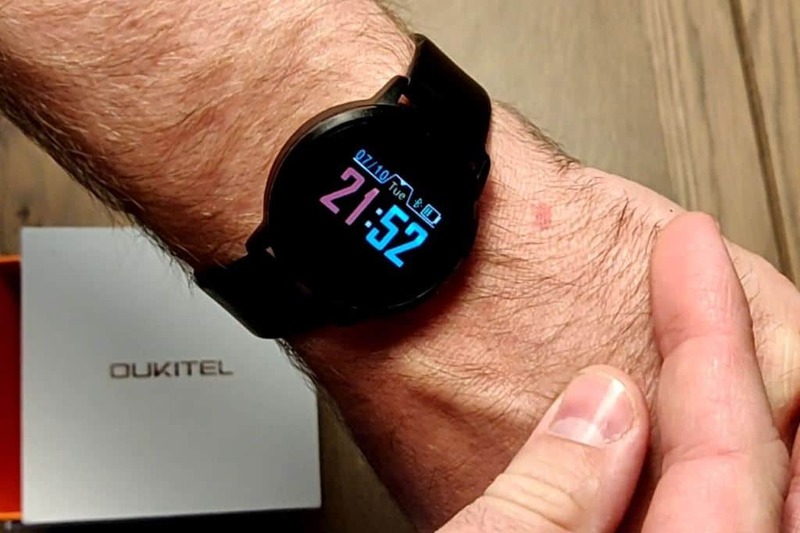 Is the €35 Oukitel W1 Smart Watch a smart choice? 3.1 Does it fit your mailbox? At its price point I do not expect that the Oukitel W1 Smart Watch is of the best quality. I hope the product itself, the software or user interface and integration with my smart phone are acceptable. The product is shipped in a lovely white cardboard box. A USB charging cable (without a charging adapter). One single page user manual in English, German, Russian, French, Italian, Spanish and Chinese. 150 days long standby time affords you a long enjoyment time. The build quality is surprisingly good. The leather wristband feels solid and will not suddenly come loose once it is fastened around your wrist. The watch itself feels durable, and the screen seems to be scratch-resistant (to a certain degree). It is strange that there are no buttons on the watch, but that is because there is a touch button on the screen. 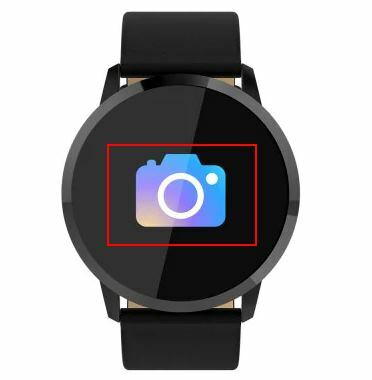 The only disappointment regarding the build quality is that the display does not cover the whole watch surface, but only half of it in the shape of a rectangle in the middle (as drawn in the picture below). One of the marketed main features is the 150 days standby time. That is probably true if you don’t wear the device, don’t connect it to Bluetooth and don’t use the smart watch at all. When normally using the smart watch you have to recharge it after 10-15 days (depending on the frequency of use). This is still much better than almost all other smart phones. Charging the smart watch is done within 2,5 hours. 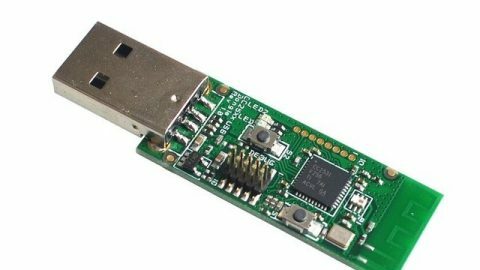 You need some instructions to get started with the W1, since the device does not have any visible buttons. There is a switch button under the display, which can be pressed briefly (switch functions) and longer (to start a function). When you raise your wrist the watch lights up and displays the time. The overall use is less smooth then the Apple Watch, because it’s a bit slower and less responsive. The LED screen is also less bright, covers only half of the watch screen (see the picture above) and has a lower resolution. Notifications on your phone are sometimes useful and sometimes totally not. Text messages are displayed on the screen with the sender, but of WhatsApp messages only the sender is shown. Changing the text size to a smaller font would be a good improvement. The phone is equipped with a nice set of features. 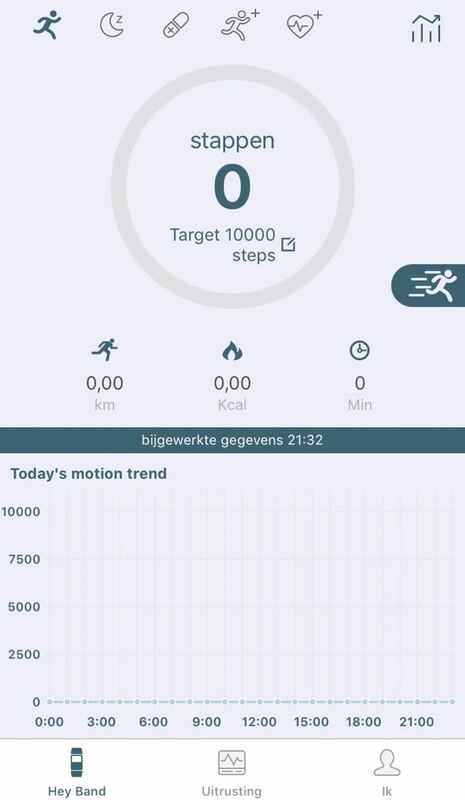 The pedometer acts a bit strange because it starts at the count of 10 steps, but after a few steps it works pretty well. The performance heart monitor is comparable to the one on my Fitbit HR 2. 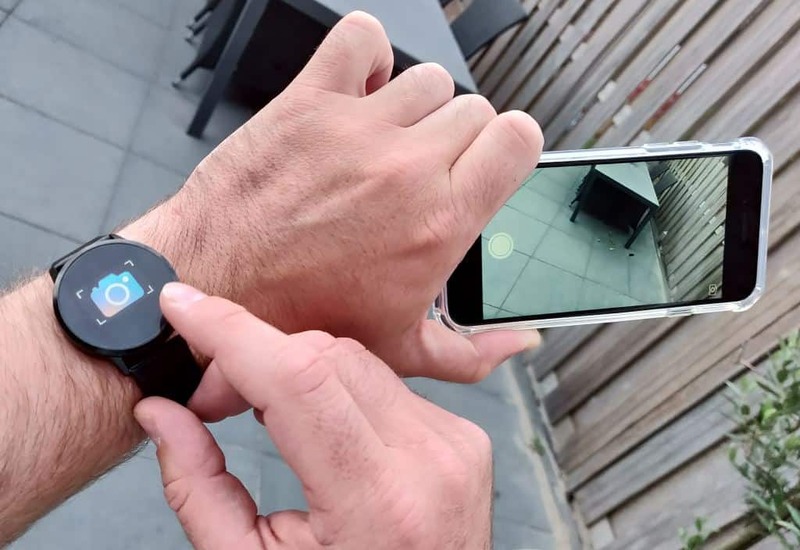 A nice extra feature is that the Oukitel W1 SmartWatch can act as a remote trigger for your smartphone camera. 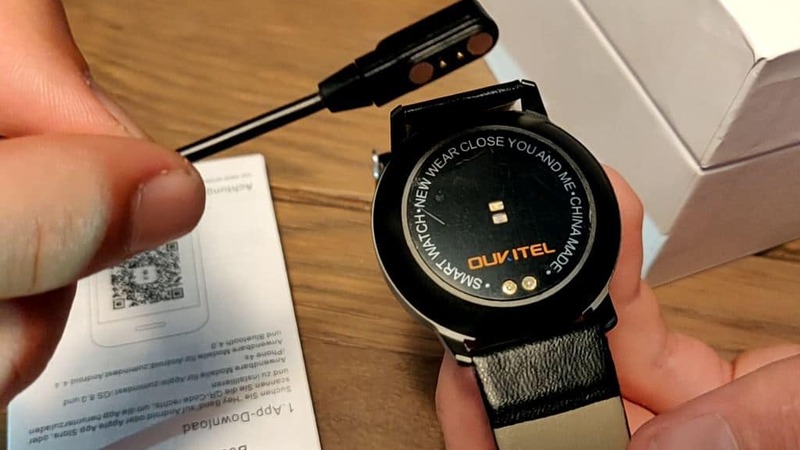 You can charge the Oukitel W1 Smart Watch by snapping the magnet connector of the USB cable on the back of the phone. No power charger is included with the product but you can charge the smart watch with any USB power source. To connect the smartwatch to your smartphone you need the Hey Band app. There is a QR code located on the manual, which leads you to the download page of the Hey Band app. You need to create an account before you can use the app. After your registration, you need to supply personal information, like your gender and your blood pressure range. The app registers your steps, blood pressure and so on. 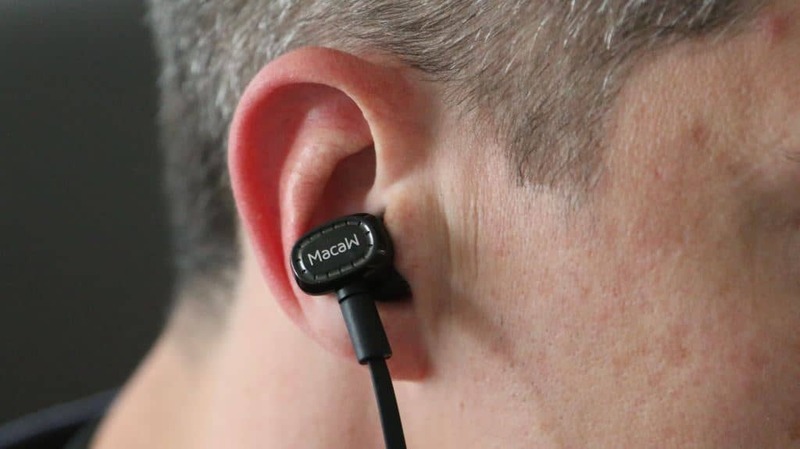 I used it on my iPhone and I found that the built-in Health features a better to use. 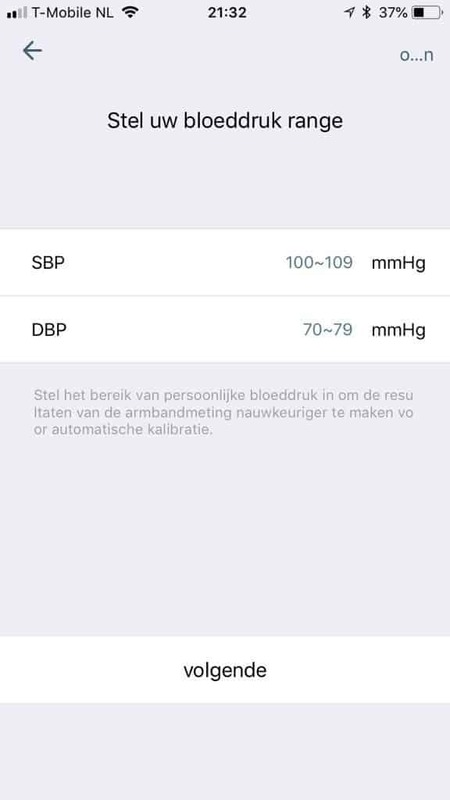 This is possible because the device shows up in the Health app as a source. After a while, I only used the app for changing the watch dial and performing a firmware update. Smart phone interface feels a bit slow. Won’t last for the marketed 150 days on a single charge. 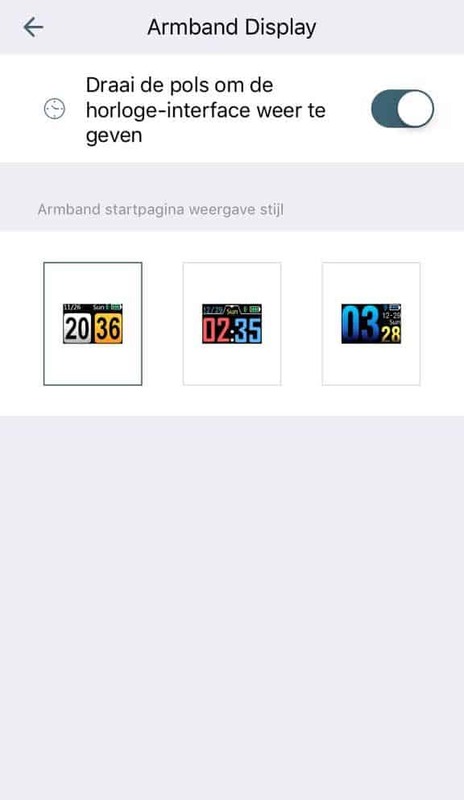 Requires an account to use the watch in the Hey Band app. The amount of smartwatch you get for the price you pay is great. The total of the features, like the heart rate monitor and the low power consuming Bluetooth chip, makes the smartwatch a good option for people who want to buy a smartwatch in this price range. The Oukitel W1 SmartWatch is available in different colors: Blue, White, Gold and Silver. 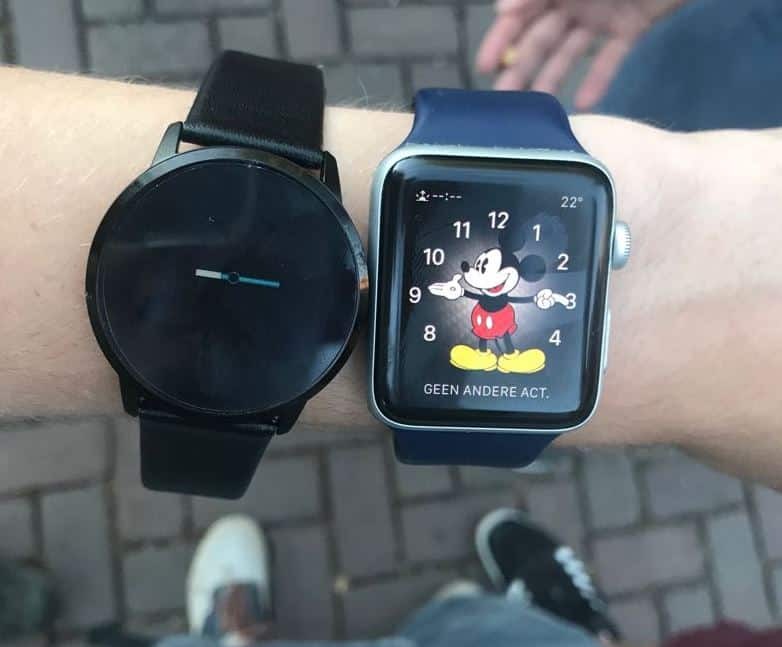 The reviewed watch is Black. For the price, the Oukitel W1 Smart Watch is a very good product. Don’t expect it to outperform the Apple Watch, but the hardware quality is good and the design is elegant. The software component (both on the device and the app) is acceptable but could be better. 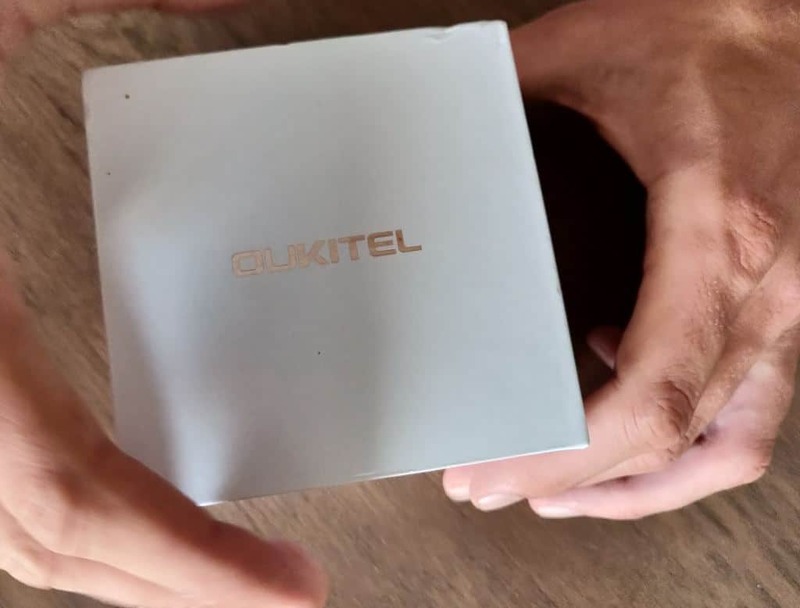 If you don’t want to spend a lot on a smartwatch, or you are in doubt whether a smartwatch is a product for you the Oukitel W1 is a smart bet. I bought this good-looking shaver. But does it do the job? Let’s see if the Xiaomi Mija Electric Shaver is worth your money. 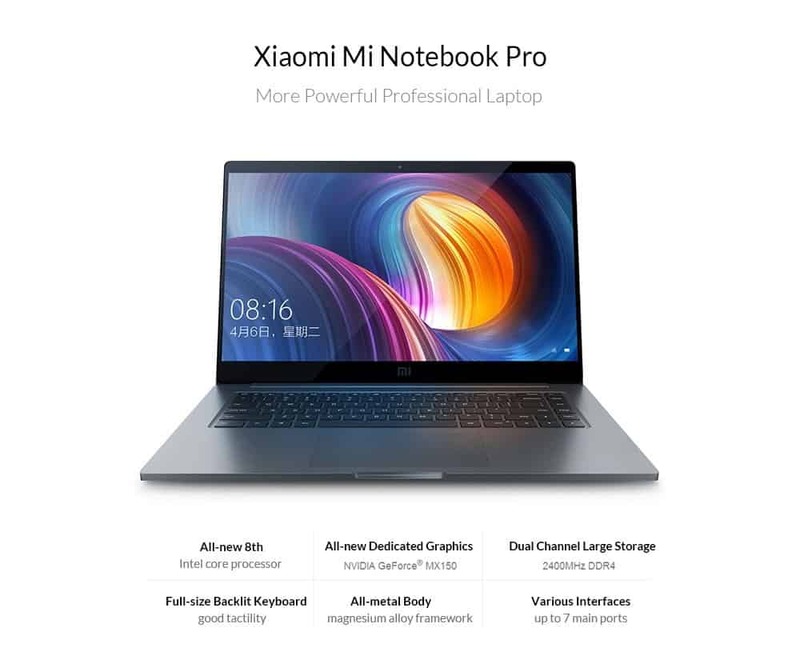 Xiaomi Notebook Pro 15.4 after 8 months, still an Apple killer? Xiaomi Notebook Pro 15.4 after 8 months, still an Apple killer? Let’s find out in this review. 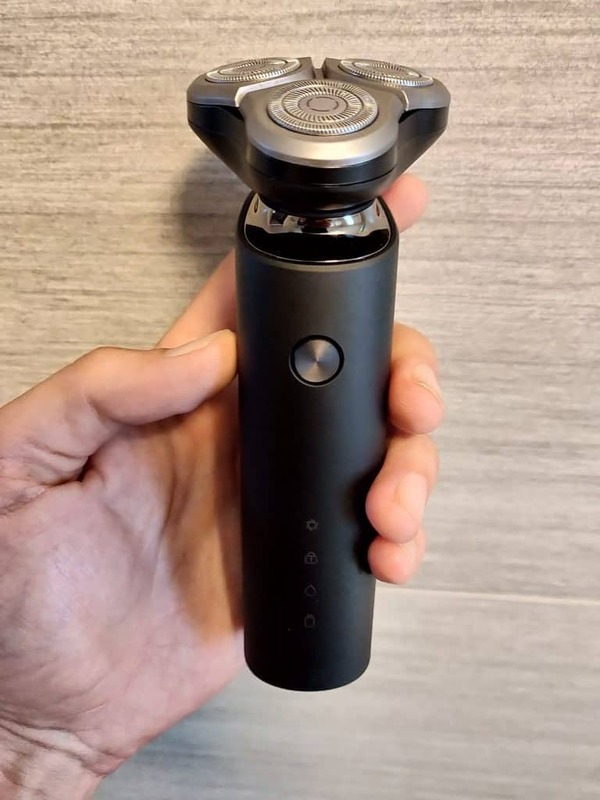 Quality of Xiaomi, looks of a Dyson. Is this worth your money?